Find out what we at Durrant Medical Clinic can do to help you lead a healthier lifestyle. Meet our healthcare practitioners and learn more about them. Our aim is to give our patients the highest possible quality of care by ensuring excellence in all aspects of our practice. We endeavour to provide patients with the best and most current treatments, methods, materials and equipment within our resource capabilities to ensure patients receive the high quality of service they have come to know from our doctors and staff. We believe that patients come first. Our patients are assured to receive timely care and advice appropriate to their individual needs. Patients have the opportunity to communicate their health concerns, and receive enough information to make informed decisions with their doctors about their care. Our focus is not only on disease prevention and treatment but on health promotion as well. We welcome new patients and families to our clinic. We believe your time is valuable so to make the process quicker, please download a New Patient Form and a Patient File Transfer Form to complete at home prior to your visit. Please bring the forms along to your appointment. 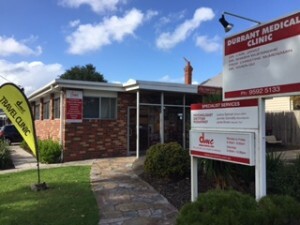 Durrant Medical Clinic is proud to offer speciality services such as Shared Care with Sandrinham Hospital, Travel Medicine and Vaccines, Iron Infusions and Skin Checks. We are closed Sunday and Public Holidays.